What is Russian SCENAR Therapy? The Russian SCENAR was originally developed by Russian scientists in a highly funded, top secret project to become part of the RUSSIAN MIR space platform health maintenance program. The Russian cosmonauts needed to overcome the unique problems of space travel which included finding a way to heal the body in space without the use of pharmaceutical drugs. The SCENAR device is a box about the size of a TV remote control. It is moved over the skin, and can feel tingly. It sends impulses to the brain, encouraging it to redirect its activity towards the area of pain. The SCENAR device has been sought after worldwide by professional sports organizations, medical centers, as well as other pain management specialists, orthopedic surgeons and medical doctors. The SCENAR is also routinely used in some areas of Russia in the emergency rooms of hospitals. The SCENAR device works on two levels: bio-electrical: it clears blocked electrical pathways throughout the body, and bio-chemical: it includes the Central Nervous System in the healing process by encouraging it to manufacture specific neuropeptides (the key biochemicals needed by your body to heal itself). Results are often very quick with SCENAR, but the speed of recovery depends on how long the problem has been there. Treatments need to be close together, i.e. two or three times a week, for best results. Also, for best results, it is advisable not to bathe or shower for two hours before and after treatment, as SCENAR therapy works with the special information contained in the substances found on the skin. Since the SCENAR device interprets information from the skin, it can also be used to enhance the healing power of Traditional Chinese Acupuncture points. What problems can be treated by SCENAR Therapy? Any pain can be treated with SCENAR Therapy (frozen shoulder, scoliosis, back pain, tennis elbow, ankle sprains). 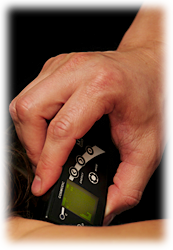 The SCENAR device is FDA approved in the treatment of pain relief only. However, the Russian studies suggests that it can be effective for a very broad range of diseases, including diseases of the digestive, cardio-vascular, respiratory, musculo-skeletal, urinary, reproductive and nervous systems. It has also been found helpful for burns, fractures, insect bites, allergic reactions, diseases of the blood and disorders involving immune mechanisms: endocrine, nutritional and metabolic disorder; stress, depression, managing ENT diseases, eye diseases, skin conditions and dental problems. Tests conducted in Russia have shown the device to be effective in 80% of cases treated. It is important to know that SCENAR treatment cannot be given to people with a pacemaker.